United States Supply Co., Inc. carries a wide variety of general industrial supplies for nearly any production line. We inventory abrasives, polishing compounds, carbide inserts, PCD inserts, and many industrial specialty tapes. Abrasives range from emery (cloth or paper), shop rolls, wet or dry sheets, non-woven abrasives, screen-back rolls, sanding discs, belts, etc. We also have many specialty tapes such as heat resistant tape for plasma spray, plating tape, general-use masking tape, teflon tape, stretch film, etc. If your operation requires specialty tapes of any kind, we can provide them for you. For any of your industrial needs, United States Supply Co., Inc. is the place for you. We have the staff and the resources to provide with you with the best pricing and service available. We truly are a "one stop shopping" source for all your industrial needs. 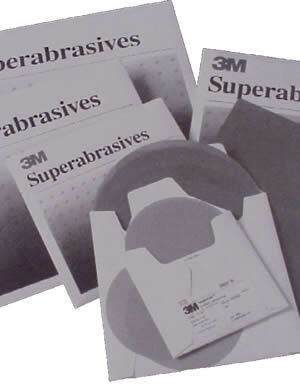 3M �Imperial� Lapping Film is our premium, precision abrasive for producing a super-fine, super-consistent finish. A high strength polyester backing provides a uniform base for a coating of micron graded mineral particles that are uniformly dispersed for greater finishing efficiency. A carefully controlled resin bond ensures a consistent, reliable, and repeatable finish. Clean room coating and converting ensures contaminant-free products. Applications: plastic, metals, magnetic media, CDs, DVDs magnetic boards, floppy discs, fiber optics connectors, metallography, and other lapping and polishing applications. Converted Forms: sheets, discs, rolls. Available Backings: 1, 1.5, 2, and 3 mil thickness. Discs and sheets available with self-adhesive backings. Available Minerals: Aluminum Oxide, Silicone Carbide, and Chrome Oxide. Available Grades: 0.05, 0.3, .05, 1, 2, 3, 5, 9, 12, 30, 40, and 60 micron. (Not all grades available in all products. Imperial� Lapping Film Type F: provides the desired cut and finish for floppy disk burnishing operations. Imperial� Lapping Film Type P: resin bond is harder than the standard product. Often used in polishing hard plastics. Imperial� Lapping Film Type R3: developed for polishing rigid memory disks and texturing thin film disks. Resin bond is harder than the standard product. 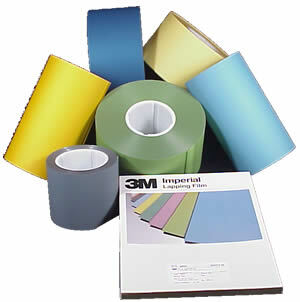 United States Supply Co., Inc is a major supplier of 3M lapping films for finishing all materials. We specialize in films for polishers such as the GEM Superfinisher. We inventory nearly all grades in 4" and 8" widths ready for mounting on your machine. 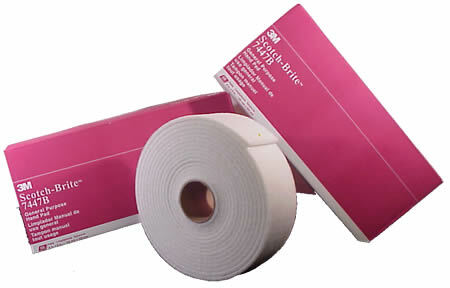 There are other generic films available, but none offer the quality and consistency of performance of 3M films. United States Supply Co., Inc inventories many of these films for a variety of users therefore we offer immediate shipment and competitive pricing. A fast cutting abrasive that provides precise, consistently uniform, close-tolerance finishes. A high-strength polyester film backing is coated with premium, micron-graded mineral particles that are electrostatically oriented for greater cutting efficiency, and resin-bonded for increased durability. Applications: metal, plastic, fiberglass, solid-surface composites, wood, paints and primers, automotive power train components, superfinishing. Converted Forms: sheets, discs, rolls, belts. Available Backings: 3 mil or 5 mil thickness. Discs and sheets available with self-adhesive, Stikit� , or Hookit� backings. Available Minerals: Aluminum Oxide and Silicon Carbide. Imperial� Microfinishing Film Type S: has our standard backsize for non-slip performance. Designed primarily for roll goods to be used in indexing operations. Imperial� Microfinishing Film Type Q: has a more aggressive backsize than the standard product. Designed primarily for roll goods in indexing operations such as crankshaft and camshaft polishing where additional friction is required for non-slip performance. Imperial� Fre-Cut� Microfinishing Open Coat Film: Mineral is applied to the backing in a open coat pattern to prevent loading and increase product life. It's Fre-Cut� coating provides extra loading prevention in dry sanding operations. Developed for use on softer materials such as wood, polyurethane, paints, sealers and plastics. 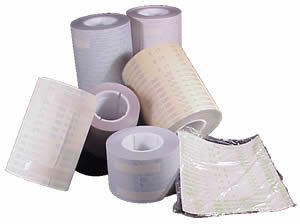 United States Supply Co., Inc. inventories most grades of microfinishing films for metal finishing. With major concentration on polishing chrome plated rolls, we inventory grades from 60 micron to 9 micron in roll sizes of 4" and 8" ready to mount on most any polisher made. Our experienced staff can assist you in setting up your polishing procedures to ensure that you are getting the most from your 3M films. Today, coated abrasives have become an indispensable tool for processing a multitude of materials. Applications range from surface leveling and smoothing, to polishing and grinding. Based on nearly 100 years of experience, 3M Research has been a leader in developing many new coated abrasive products and systems for modern production operations. Coated abrasives are manufactured from three materials: a mineral, a backing and an adhesive bond. 3M uses 7 minerals, 5 backings, and 4 bonds to offer a vast number of practical, durable production tools. United States Supply Co., Inc can assist you in finding the right combination for maximun value and performance. Minerals: emery, garnet, aluminum oxide, alumina zirconia, silicon carbide, ceramic aluminum oxide, and industrial diamonds. Backings: paper, cloth, fibre, combination, and polyester film. Bonds: glue, resin over glue, resin over resin, waterproof. Coatings: open coat, closed coat, gravity process. 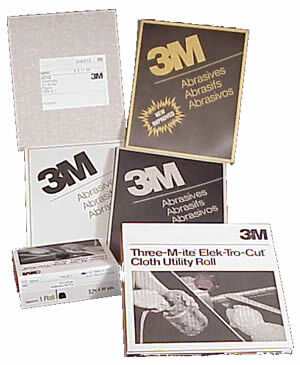 Lead Time: As an authorized agent for 3M abrasives, United States Supply Co., Inc., stocks common sizes and others are available within 1 day on standard 3M items. 3M Scotch-Brite� Hand Pads out perform steel wool and wire brushes. They are fast cutting with consistent finish for surfaces that need to be cleaned or finished by hand. These pads are non-rusting and can be used with water or solvents. We recommend the 7447 hand pad as the best starting point for cleaning and finishing. There is no question that 3M Scotch-Brite� is your best choice for cleaning and finishing surfaces by hand. Imperial� Diamond Lapping Film offers a repeatable, precision finish on extremely hard materials. It combines micron-graded diamond particles, a resin bonding system and a highly uniform polyester film. Applications: carbides, ceramics, high-hardness metals, rocks and minerals, fiber optic connectors, magnetic heads, roll finishing for paper mills, metallurgical testing, and other lapping and polishing applications. Available Backings: 0.5, 1, 1.5, 2, and 3 mil backings. Sheets and discs available with self-adhesive backing. Imperial� Diamond Lapping Film Type B: Diamond particles are contained in ceramic beads which makes this product more aggressive than the standard product. Grade for grade a Type B product will yield more cut, longer life, and a coarser finish. Recommended for extremely hard materials and larger parts. Imperial� Diamond Lapping Film Type P: The resin bond is harder that the standard product. Used primarily in roll superfinishing applications and flat lapping operations. Imperial� Diamond Lapping Film Type H: Provides a higher cut rate and longer life than the standard IDLF. A thicker diamond coating and harder resin prevent "score through" and increase cut rate, making this a long lasting, clean polishing, premium diamond abrasive. Used primarily for fiber optics and Connector polishing.